With crew chief Robbie Reiser back home in North Carolina on a NASCAR-enforced absence from the racetrack, Matt Kenseth and the rest of the No. 17 team just tried to remember the lessons he has taught them over the years. 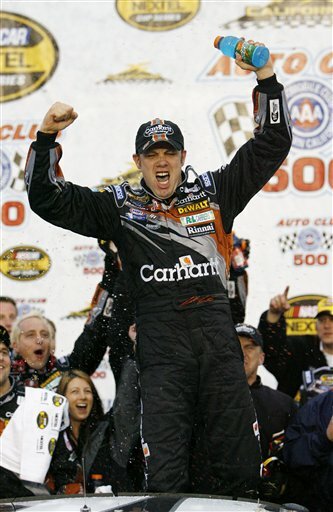 Kenseth drove the Roush Fenway Racing Ford to the front and his veteran crew gave him a series of sparkling pit stops, including a very fast one Sunday near the end of the Auto Club 500 that put the 2003 NASCAR champion into the lead for good. "It's a special win," an emotional Kenseth said after bouncing back from a disappointing Daytona 500 with his second victory of the weekend and second Nextel Cup win at California Speedway. "It's not without Robbie though. He spent the week at home while we were at Daytona building this car. Robbie built this team." Kenseth, who got caught up in the last-lap melee the previous week at the Daytona 500 and wound up 27th after starting that lap in third, stayed away from trouble this time and took the lead with the fast stop during a caution 23 laps from the finish. The victory, his 15th in Cup, came with engineer Chip Bolin sitting in for Reiser, sent home for four races after the team was caught cheating at the beginning of Daytona's Speedweeks. And it came less than 24 hours after Kenseth won the Busch Series race on the same 2-mile oval. A year ago, it was Jimmie Johnson whose team overcame the loss of crew chief Chad Knaus to get off to a strong start on the way to a championship. "Those guys didn't let some bad luck stop them or slow them down," Kenseth said. "Everybody on this team knows what Robbie would expect them to do, whether he is here or not." Kevin Harvick, who swept the Busch and Cup races at Daytona, came out of the final pit stop in second and was making up ground up Kenseth until rookie David Reutimann and former series champion Bobby Labonte crashed on lap 243 of the 250-lap event. NASCAR red-flagged the race to give safety officials time to clean up the debris from the wreck. Once the cars were restarted, Harvick found he had a deflating left front tire and had to pit. He wound up 17th, the last car on the lead lap. It was a relief to Kenseth when Harvick no longer loomed in his mirrors. "I thought I was going to have a problem because I really thought the 29 (Harvick) was going to run me down," he said. "Then, he had his problem and Jeff (Gordon) moved up to second and I thought he might run me down. But we got a real good restart and, after that, we were OK.
"It's really nice to get some of our points back from the Daytona deal," added Kenseth, referring to the 50 points he and the team were docked in the cheating incident. "It's a shame," Harvick said about the flat tire. "I don't know if we could have won it, but running with the leader and having a chance to win is what it's all about." Three-time California winner Gordon, the only other multiple Cup race winner here, jumped past Jeff Burton into second on the restart with four laps to go, but couldn't get close enough to challenge Kenseth the rest of the way. Kenseth won by about six car-lengths. Defending Cup champion Johnson, who finished 39th at Daytona, also bounced back with a third-place finish Sunday, followed by Burton, Mark Martin, Clint Bowyer, Kurt Busch, Tony Stewart and Kyle Busch. Johnson's Chevrolet was in the lead, with Kenseth's Ford close behind, when debris on the backstretch brought out a caution flag on lap 226 _ the first yellow flag since the track went green on lap 126. All the leaders pitted on the next lap and Johnson agonized through a slow stop, falling all the way to fifth. "That's all I had," Johnson said. "We had a bad pit stop and we just ran out of time." Gordon said he was just lucky to finish second. "If Kevin hadn't had that flat tire, we would have probably finished third or fourth," he said. "It's crazy the way things happen. ast week, he wins the Daytona 500 and, this week, he has that flat tire. It's too bad." Martin, who lost to Harvick at Daytona by the length of a hood, had another good race and put himself and his new team, Ginn Racing _ Formerly MB2 Motorsports _ into the series points lead. It's the first time leading the points for the team, now in its 11th year. It also was a good day for Brian Vickers, who gave Team Red Bull its first top 10 finish in the first race the new Toyota team has been able to qualify for. The race was the debut for unleaded fuel in NASCAR's premier series. Several entries blew engines, including DEI teammates Dale Earnhardt Jr. and Martin Truex Jr. and Evernham Motorsports' Kasey Kahne, but the teams said they would need to examine the engines closely to determine if the fuel had anything to do with the problems. "We were happy to bring the car home with that new unleaded fuel and now we're all anxious to see what the inside of that engine looks like," Gordon said.